Ladakh’s ‘Manjhi’: Spent Life Savings, Sold Ancestral Property to Construct 38 km Road! Everyone knows about the fantastic story of Dashrath Manjhi, the villager from Bihar who carved a path through a hillock using only a hammer and chisel. It’s a story of resilience, grit, perseverance and dedication that has resonated with every Indian. Well, 75-year-old Tsultrim Chonjor, fondly known as ‘Meme Chonjor, who comes from the remote village of Stongde in the Zanskar Valley of Ladakh, has a similar story to tell. The former government employee, who was working with the State handicrafts department from 1965 to 2000, was unhappy at how remote and inaccessible the region was for the rest of the Indian mainland. As a result of this, the entire region of Zanskar, which falls under the Kargil district and is located at an altitude ranging from 11,500 to 23,000 feet above sea level, was for decades neglected by both the local and State administration. Earlier this year, the Border Roads Organisation completed the construction of a 140 km-long road between Darcha in Himachal Pradesh to Padum town, the administrative centre of Zanskar, via Shinkula pass perched at 16,500 feet. From Padum, the road goes on through to Nimoo village in Leh district. Even though, for the time being, only small vehicles can pass, the NPD (Nimoo-Padum-Darcha) road is po tentially a critical piece of infrastructure, and not just for civilian purposes. After the recent Chinese incursions, it had also assumed massive importance for Indian armed forces to connect these areas better to ensure regular movement of troops and supplies. “Presently there is a single way to reach Kargil via 474 km long Manali-Leh highway. But with the connection of Darcha Road with Shinku la Pass, the road will become an option to reach Kargil sector directly as the shortest route for army vehicles, which at present were forced to ply via Manali-Leh highway,” said a senior BRO officer, to the Hindustan Times, in 2016. “The safety of Zanskar is also vital to the safety of Leh, Lahaul, and East Punjab… For as long as we hold Leh and Zanskar, we hold the entire district and guard Kashmir, Changthang (in eastern Ladakh) and Lahaul against possible invasion,” wrote historian HN Kaul in a letter to Jawaharlal Nehru. Back in May 2014, however, the circumstances were very different. One of the most pressing issues was the lack of proper road connectivity that links this area with the rest of the region. The 292-km Darcha-Shinkula-Padam-Nimoo road was planned in 2001. Despite repeated pleas to the authorities, there was little action on the ground. However, Meme Chonjor wasn’t one to wait. He was determined to ensure that his efforts would make a difference to the lives of not just his fellow villagers, but also the rest of the region. 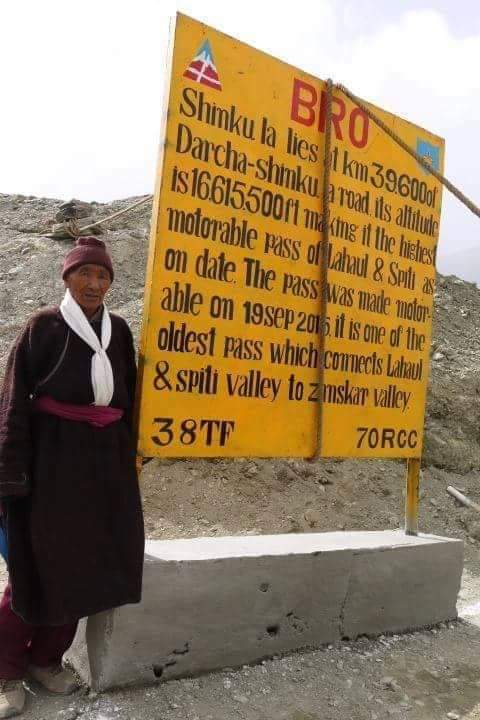 From May 2014 to June 2017, he singlehandedly led efforts to construct a 38-km stretch of road from Ramjak, an inhabited area on the Jammu and Kashmir side of Shinkula pass, to Kargyak village, the first properly inhabited village in the Zanskar region. Spending Rs 57 lakh from his own pocket after dipping into life savings and selling his ancestral property, Meme Chonjor pressed a JCB machine into action, set forth with five donkeys and constructed the road. The Border Roads Organisation (BRO) later undertook road widening construction on this stretch. He even received funds from a few other locals, who were in favour of the road—Rs 5 lakh from the local councillor and another 2.5 lakh from a local merchant, among other locals. “Seeing the pain and suffering of others had inspired me to construct this road,” says Meme Chonjor. There were some initial challenges when the construction process began. Security forces stationed there enquired about where he was getting the necessary funding from for the construction of this road. “After I briefed them about my financial source, there was no further objection,” says Meme Chonjor. There were significant climatic challenges as well. For starters, constructing the road at an average altitude of 3500 metres (11,500 feet) above sea level took its toll on Meme Chonjor’s health, even though he had lived most of his life in Zanskar. Other challenges include a short working season of four to five months since there is absolutely no scope for work in the harsh winter months when the temperatures in these parts drop would drop to -30-35 degrees Celsius. However, he was unperturbed by all this. How does Meme Chonjor sustain himself financially after nearly spending all his life savings? “I believe in simple living, so I don’t need massive financial support. How much does one really need? I survive on the regular monthly pension I receive from the government,” he says. Such volunteerism and philanthropic gestures from the likes of Meme Chonjor are indeed inspirational, and empower others in his village to shape their own destinies.